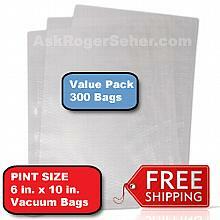 Weston Zipper Seal Vacuum Bags - Quart 8 x 12 (50 ct.) 30-0208-W has been added successfully to your wishlist. Ever store something in a vacuum sealer bag only to open it, to take a few pieces of what's inside out, then you have to reseal the bag with the vacuum sealer again? The Zipper Seal vacuum bags allow you to vacuum seal, open, use, zip back up, and store for maximum freshness, flavor, and safety! These BPA-Free heavy-duty bags work just as well as Weston's traditional vacuum bags with the added benefit of the zipper. Now you can store your items long term, open them, and continue to store what you don't use for the short term! 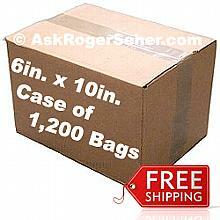 Can be used with most leading brand vacuum sealers like FoodSaver, Weston, Cabelas, etc. 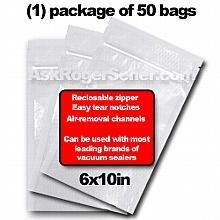 There are currently no reviews for Weston Zipper Seal Vacuum Bags - Quart 8 x 12 (50 ct.) 30-0208-W, but you can be the first!